This term refers an accidental symbol that raises a note by three semitones (or three half steps). This symbol is indicated by a sharp symbol (♯) and a double sharp symbol (𝄪) preceding the note. It should be noted that the triple sharp is extremely rare and can only be found in a very few compositions throughout all of the history of modern musical notation. It is only used in classical music and is more theoretical than practical. Most musicians (professional or amateur) will never see or perform a triple sharp in their entire musical career. The triple sharp symbol alters the pitch of the note to which it is attached as well as any subsequent occurrence of the same note (identical line or space) in the same measure. Notes with the same pitch name, but a higher or lower octave, are not effected. Any note with a triple sharp that also has a tie across a barline carries the triple sharp to the note on the other side of the barline. Notes in the new measure that are not tied to altered notes from the previous measure revert to their original pitch and are performed using the current key signature. It should also be noted that a triple sharp will always be shown with the sharp (♯) symbol followed by the double sharp symbol (𝄪), regardless of the key signature. 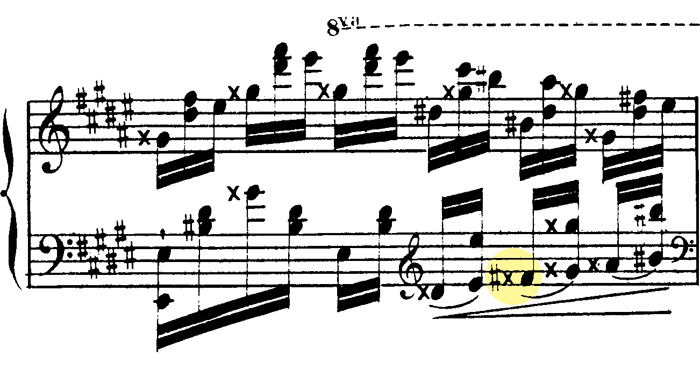 The example below shows a rare triple sharp in the Etude no. 10 from Douze etudes dans tous les tons mineur, Op. 39 (1857), by Charles-Valentin Alkan.